Work with me — Annamieka: Artist. Let's Bring Your World to Life. You are an artist. Come home to yourself. Make the art your heart yearns to make! I know what it feels like to give up on being an artist. To get stuck, and scared. You haven’t made art your career - and you fear that it might be too late. After getting my BFA, I just didn’t see how I could make a living with art using the framework outlined by my professors: create work, get gallery representation, and hopefully get into museums. I put art on the back burner—I participated in some art activities, but I figured I should get into healthcare for a career. I spent the majority of my twenties as a walking question mark, trying to decide which type of healthcare practitioner I wanted to be whilst my art degree gathered dust on the wall. I changed paths several times, and it’s no wonder: in my heart of hearts, I really wanted to be an artist, not a doctor, physical therapist, or massage therapist. Click here if you want to read more about my journey back to art. I was always an artist, but I didn’t always respect that calling. It took time, but eventually I did a course-correction, showed up for myself and my art, and joyfully rediscovered my voice. I spent time exploring and sharing my work. 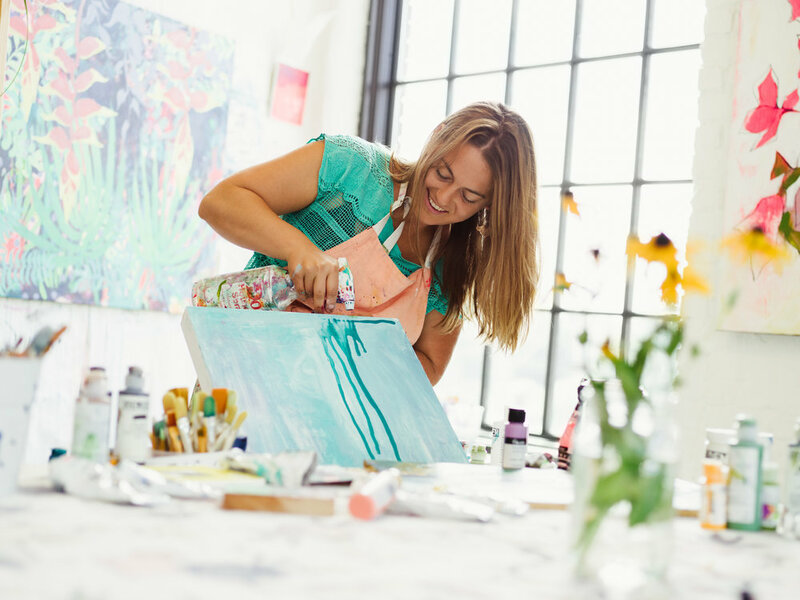 I discovered that I could use the business skills I’d learned from running my massage therapy business to find ways to make a living from being an artist. I’ve never looked back. My soul is so thankful that I answered its call. I’m here to help you answer that call. I’m here to help you honor the artist that you know in your heart that you are and to give you time, space, techniques, and encouragement to show up for yourself and make art. Maybe you’ve never made art. Maybe you used to make art and you stopped. Maybe you’re currently making art and you want to try new techniques and get inspired in a different direction. Let’s get going—I’m ready to take you on a revitalizing creative adventure! Nothing gives me greater joy than setting my students free with my unstructured layering techniques and watching them create joyful art! Join me for a class, or creative mentoring, and show up for your artist self. Answer the call! 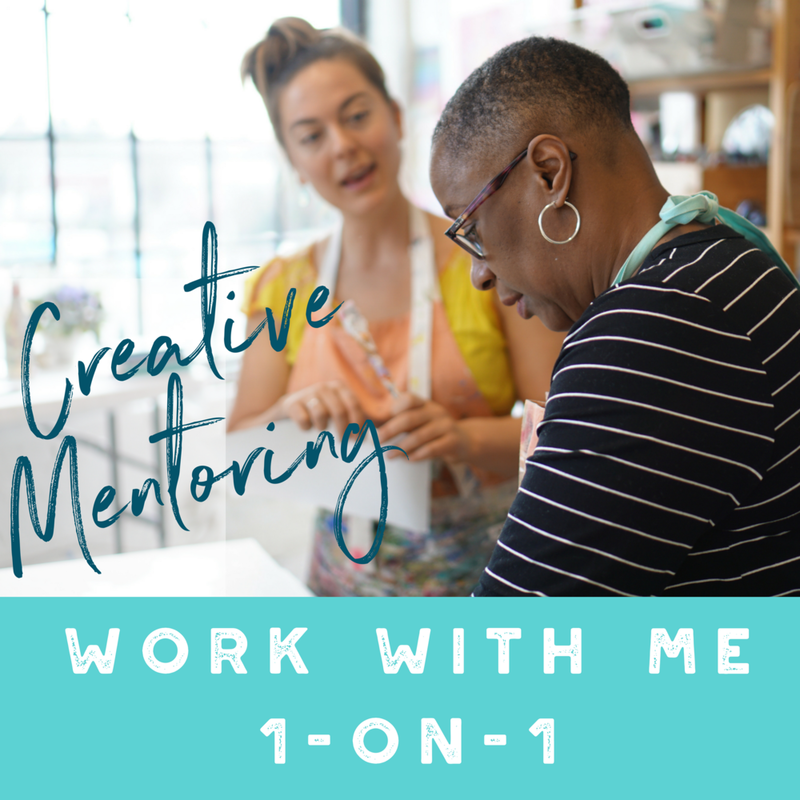 I offer one-on-one creative mentoring sessions for artists. This is for you, when you need full focus from someone who is walking the path, too. Do you feel stuck, scared, or intimidated to show up for your creative calling? Do you need a pep talk, to get to work? Do you need a truth bomb to blow through your creative blocks? Perhaps you're like me, and it's a combination of all three. That's totally normal! Being an artist and making your life's work is one hell of an adventure, and it really helps to have an enthusiastic guide. I absolutely love working one-on-one with people to achieve your creative dreams. In our sessions together, I will listen to exactly what is going on with you, and pinpoint strategies to overcome any blocks or obstacles that we can find. I will share resources and experiences that I have learned from, to help you along your path. My goal in our work together is to encourage you to work with velocity and in alignment with your soul's true calling. I have invested in mentoring and coaching throughout my career as an artist and I have always been deeply grateful for the clarity that it brings. It is an investment in your success. Mentoring sessions can be done in my studio in Portland, Oregon, or remotely via Zoom video conference. Our calls will be recorded for your reference. A year-long creative mentorship program for artists to create a cohesive body of work. So, with that lightning bolt of clarity, I wrote out an entire year’s worth of curriculum for my own thesis year in art, and I’m gathering up a group of artists to do it with me, as a year-long online program! It’s called “Let’s Go Deep” and it’s going to be RAD!!! Let’s Go Deep is all about getting into the studio, making work, and inventing a creative practice that is all your own. By the end of the year you’ll have a cohesive body of work that absolutely pulses with life and expresses your unique voice. I invite you to come on this adventure with me, if you are ready to bust through your fears and blow your own mind with how much you love your new work. Let’s Go Deep is not a paint-like-me class. Not at all. This is about YOU and finding YOUR voice. This is about your materials, your process, and what you want to say. Artists of all stripe are welcome. Beginner to intermediate to practicing professionals who want to create a strong, cohesive new body of work. I am going to be leading it from my practice as a painter and mixed media artist but it’s applicable to any art media. This is for you if you already have a BFA or MFA but crave another thesis year experience. And this is for you if you’ve never been to school at all. I’m going to be doing some radical things to get deep into this next body of work, and I’d like to invite a close-knit cohort of adventurous artists to come along. Rawr!!! It’s gonna be GOOD. Let’s Go Deep is currently in session. Registration will open in Spring 2019 and the next round of the program begins October 2019.